Ladakh is like nowhere else you have ever seen–a high altitude desert cut off from the world for many months of the year, keeping its people and wildlife removed from the modern age. Ladakh is home to the confluence of the Indus and the Zanskar, which carry stories from an ancient past. 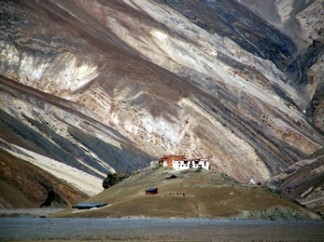 Lamas have made their homes in these Himalayas, a multitude of monasteries, which dot this land. Visit “moonscape” and Lamayuru. Cross the World’s highest motor able road into the remote Nubra Valley. Explore the White Sand Dunes. Discover Nubra Valley is your chance to deeply breathe the fresh air as you trek through a land filled with spirit. You will be met at the Delhi Airport by our representative and driven to your accommodation. Delhi: the Empress of Indian cities has a fascinating history and a stimulating present. She has often been sacked and left naked and desolate. But she could not be despoiled of the incomparable situation that marks her for the metropolis of a Great Empire. The capital of India, Delhi has been the seat of power of a number of dynasties – the Rajputs, the Afghans, the Turks and the Mughals who continued their imperial line until the British. Scattered over are surviving ruins, remnants of mighty edifices, tombs of warriors and saints, which in an impressive sense of magnificence are memorials not of a single city but of supplanted nations. After breakfast, transfer to airport for your flight to Leh. You will be met at the airport and driven to Nimmu Village. Morning after breakfast visit Confluence of Zanskar and Indus River (Sangam) and drive to Likir (25 Kms / 30 Min.) monastery. After visiting Likir proceed to Alchi (15 kms / 20 Min.) visit Alchi Choeskor and continue drive to Lamayuru. Have lunch at local restaurant and visit the monastery and the surrounding area which resembles to the surface of moon. Later drive back to Nimmu. Evening at leisure. Dinner and overnight at Nimmu House. After breakfast checkout from Nimmu House and drive to Leh. Check in at your accommodation. After settling in, drive to Thiksey Gompa belonging to Yellow Hat (Gelugpa) sect, located on top of a hill is noted for its resemblance to the Potala Palace in Lhasa, Tibet and is the largest gompa in central Ladakh. It is a 12-storey complex and houses many items of Buddhist art such as stupas, statues, thangkas, wall paintings and swords. One of the main points of interest is the Maitreya (future Buddha) Temple which is installed to commemorate the visit of the 14th Dalai Lama to this monastery in 1970. A 15 meters (49 feet) high statue of Maitreya, the largest such statue in Ladakh, covering two storys of the building is defied in the monastery. Hemis was built in 1630 during the reign of Singge Namgyal, an illustrious ruler of Ladakh. It flourished under the Namgyal Dynasty for the royalty favored the Drugpa sect, which is managed the monastery. After visiting the monastery and the museum we will drive to Matho for picnic lunch. After lunch we drive back to Leh or for the more energetic one there is an optional 1.5 miles / 1 hr hike to Gotsang gompa. The trail to Gotsang hugs a babbling stream in the middle of a narrow valley. The golden autumn colored trees hug the stream and glow brightly in the afternoon sun. This is very inspiring and relaxing simultaneously. After breakfast in the morning drive to Hemis National Park. Zinchen is the last stop that the vehicles can go. We will get out here and start our walk inside the National Park. In the evening come back to the same place and drive back to Leh. Dinner and overnight at the hotel in Leh. Hemis National Park: is located around 40 km southeast of Leh, it takes its name from the world famous Buddhist Gompa situated here. The National Park is situated at the bank of river Indus and includes the catchments areas of Markha, Sumdah, and Rumbak streams. 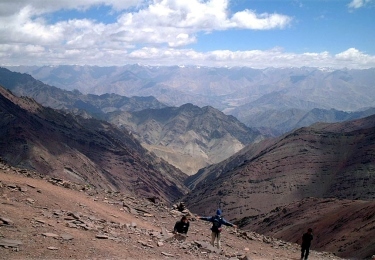 Hemis National Park is a high altitude protected area created in 1981 in the eastern part of the cold desert of Ladakh for the conservation and protection of its unique flora and fauna. It covers an area of 600 sq. kms in the Markha and Rumbak valleys. The terrain surrounding the park is rocky and the thin soil cover supports a poor vegetative growth. Dry alpine pastures are present in sheltered locations and the grass growth is relatively rapid during the summer season after the snow melts from the region. Nature & Wildlife Attractions: Dry forests of juniper, birch and fir are found in the region. Also present are the alpine grasslands and scrublands. There are many rare and endangered animal species found in the cold desert area that are also found in the Hemis national park, known to be the home of an interesting assemblage of cold desert fauna. Amongst these are the Snow Leopard, Tibetan Kiang, Ibex, Serow and Tibetan Antelope. Amongst the bird population found in the Hemis National Park are the snow, snow partridge and golden oriole. Early morning proceed to Nubra Valley via the world’s highest motor able road, Khardungla Ppass. 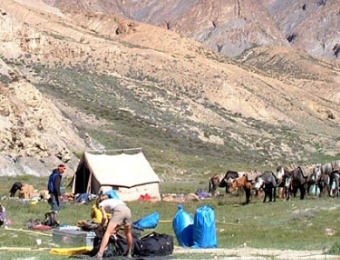 Arrive in Nubra by noon and check in at Hotel / Camp. Evening at leisure. Morning after breakfast proceed for a visit to the White Sand Dunes at Hunder. You can enjoy thea camel ride (On Own). Visit Hunder and Deskit monasteries. Evening trek to Samstaling Monestry. Overnight at the hotel / camp. 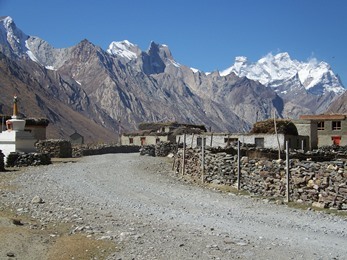 Hundar village: Hundar is a beautiful village to stay with lot of trees and you will really enjoy your stay at Hundar. It has a small monastery and ruined fort above the village. The walk or Camel Safari (Double Hump Bactrian camels) from Hundar to Deskit, through sand dunes for two hours is wonderful (On Own). Samstanling Gompa: Samstanling Monastery was founded by Lama Tsultrim Nima and Monastic community was introduced as Rezong Gompa. About 50-60 monks are residing at this 132 years old monastery. NOTE: The Gompa has some strict rules and regulations. -Women are not allowed in the monastery after sunset and before sunrise. -No smoking is allowed (not even bringing cigarettes packets) in the monastery. -Alcohol and non-veg. Food are strictly prohibited. -Do not enter in sleeveless shirts and Pants. Morning after Breakfast proceed for Leh, once again driving via Khardungla pass the World highest motor able road. Evening explore Leh bazaar for souvenirs, visit Leh Jokhang or Leh Mosque by foot. You are driven to the Leh airport to board your flight to Delhi. Upon arrival in Delhi connect with your flight home bound or to an onward destination.